Update 2: The Q&A and the Tweet linking to it have since been deleted—I have a suspicion that Sony may have preferred all eyes on PlayStation. Update: A Kojima Productions Q&A posted by PlayStation's EU Community Manager has confirmed that Kojima's new project will be coming to PC, but only after a stint on PS4. The length of the exclusivity period was not coughed up. 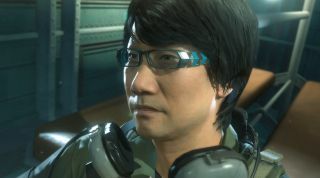 Original: Wait until Konami finds out that Kojima has started a whole new company while on holiday. There's moonlighting and then there's Hideo Kojima. Yesterday, a Nikkei report confirmed that Kojima was a free agent and in the process of setting up his own studio, and now it officially has a name: Kojima Productions. I'm sure I've heard that somewhere before. The sad news is that the first project is a collaboration with PlayStation—a new franchise according to the man himself—which may mean it will be some time before we see his unknowable mind-spawn on PC. I will blithely keep hope that this is a PlayStation 'exclusive' in the same way that No Man's Sky is a PlayStation exclusive and not in the sense that Bloodborne is.